The Bag O' Nails Club is back in swinging London. 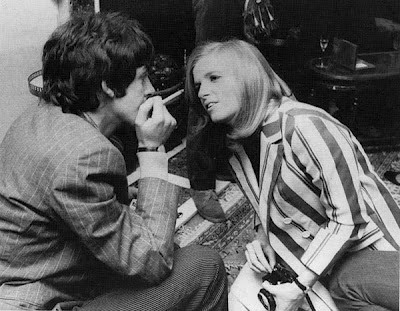 The club has been called the Miranda club for a number of years, but the new owner has probably realised that his club can pull in more money by cashing in on the fact that Paul McCartney and Linda Eastman met there, back in 67. There were no photos that we know of from that occasion, our illustrations are from a few days later, at the press party for the release of the Sgt Pepper album at Brian Epstein's house. 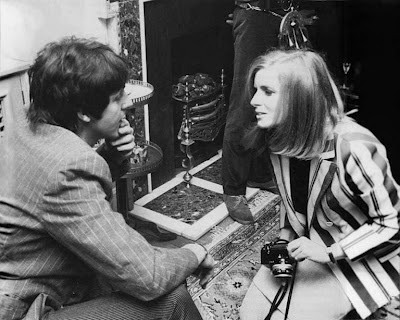 On May 15th, 1967; two people whom we know as Paul and Linda McCartney were then, Paul McCartney, a Beatle, and Linda Eastman, a freelance photographer. Georgie Fame was having a concert at the venue, but as it was over, Paul and Linda's eyes met and then as Linda was leaving, he stood up and introduced himself. 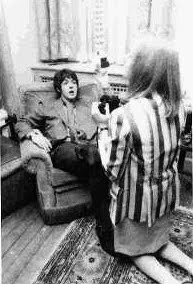 She was in the UK on an assignment to take photographs of "Swinging Sixties" musicians in London. The pair later went to the Speakeasy club on Margaret Street to see Procol Harum. They met again four days later at the launch party for Sgt. Pepper's Lonely Hearts Club Band at Brian Epstein's house in Belgravia. Find out more about the Bag O'Nails Club at their website. Is this the 'dynamic view' where blogger replaces java script and pop ups for content? If you're looking for feedback, go back to how it was! Yes it is. Trouble is, my normal layout suddenly delivered a bug: The column on the right, with all the stuff I had there, suddenly appeared at the bottom of the page, after all the blog posts. I've tried to remedy it but to no avail, so I decided to try out the 'dynamic view' for a bit. So far, that's one for and one against, judging by the commentairies.